For me, matte liquid lipsticks have lost a little bit of the draw that they had when they were first hitting the market. I'm not out there trying to get my hands on every different formula like I used to be. However, one thing that I've noticed with the new lines that have been coming out recently is that the formulas continue to get better and better. 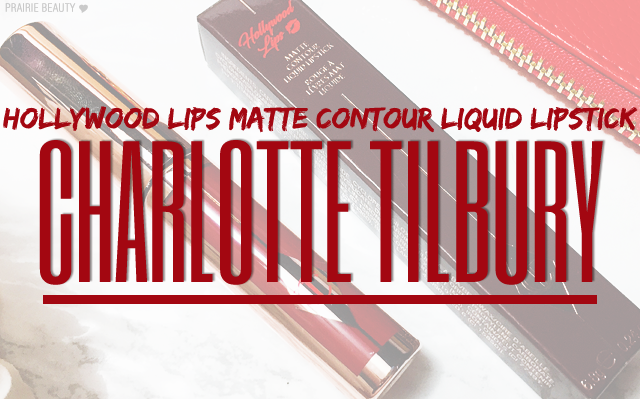 Considering how in love I fell with the Matte Revolution Lipsticks*, you can bet that my excitement was next level for the brand spankin' new release of the Charlotte Tilbury Hollywood Lips Matte Liquid Lipstick*. I mean... obviously, right? For more about the product and my thoughts on the shade Screen Siren, keep reading! 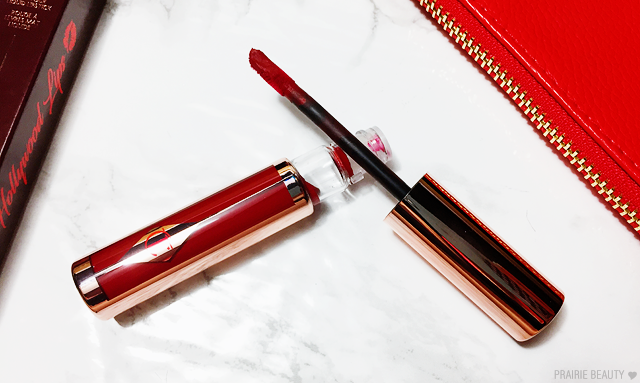 The claims on this lipstick are actually pretty amazing and initially I wondered if even Charlotte Tilbury could live up to them. It's said to "create the illusion of fuller, enhanced lips in a gorgeous matte formula," and contains anti-aging ingredients intended to slow down signs of aging in the lips and beeswax to protect your lips against moisture loss. Essentially, this is supposed to be the unicorn of liquid lipsticks - long wearing, full colour, and comfortable while actually also being good for your lips overall. Was it too good to be true? Nope. The texture of this lipstick is quite moussey and feels lightweight but present on the lips. I think most liquid lipstick fans will know what I mean when I say that. This formula doesn't set down completely, but does dry down mostly and has minimal transfer once it sets. Throughout wear, I do feel like this gets a little bit more matte, but I haven't had any issues with cracking and I've only had minimal bunching around the inner rim of my lip if I've applied a thicker layer, but it doesn't really bother me at all. I find that as I wear this, if I press my lips together I can feel that there is still moisture there and when I remove it my lips don't necessarily feel hydrated but they also don't feel dehydrated like they do with a lot of both bullet and liquid matte lipsticks in my collection. I have to say that I absolutely love this applicator. 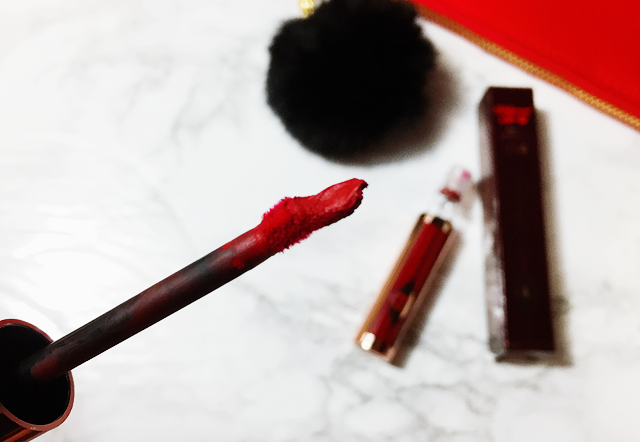 The shape is perfect for depositing most of the product towards the center of each lip and the firmness of the tip is great for defining the outer edge of the lip. The ability to define the lips without getting a thick line of product along the outer rim of the lips is a big deal for me, since a lot of both traditional and non-traditional sponge tip applicators do give me that bead of product along the outside of my lips that ends up either setting and looking weird or getting smudged as I try to blend it. Also, for two seconds can we talk about the gorgeousness of the packaging? The rose gold with the shade window along the front side of the tube is really classy but also really convenient if you have multiple shades in your collection. Let's talk about this shade, shall we? 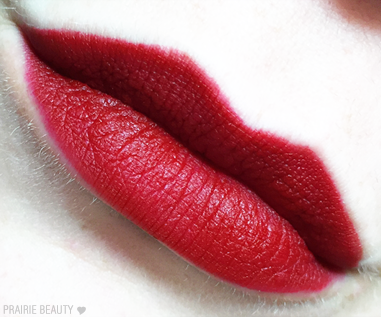 Screen Siren is definitely your classic Hollywood red and I'm completely obsessed with it. This blue based red is really flattering on literally every skin tone and helps to make your teeth look whiter. It's also not so bright that it's going to be hard to wear, but is definitely bold enough for a statement lip. I find that with the initial coat of product, this definitely leans more cherry, but if you want a little bit more depth I find that two thin layers helps to deepen up the shade and give it a little more punch. I'm obsessed. I was obsessed from the very first time I put this product on. 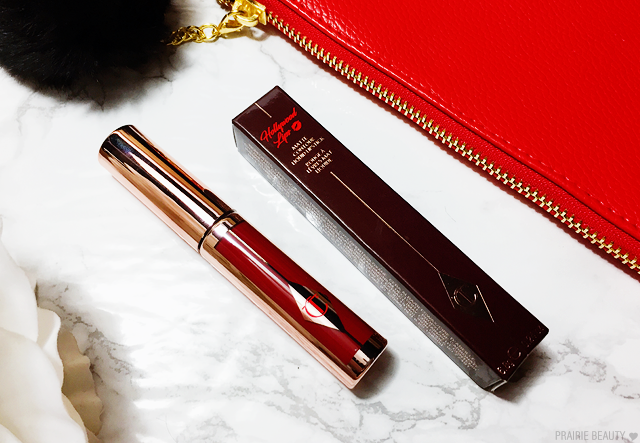 Applying it is really easy and precise because of the design of the applicator, the formula is really soft and comfortable on the lips, and the shade and formula look absolutely amazing. 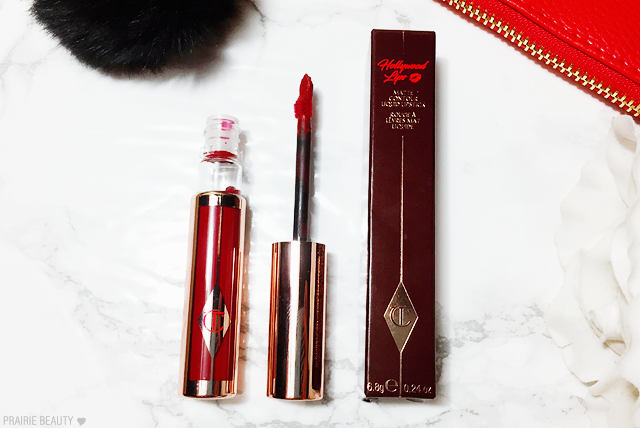 I have a feeling that this is going to be the only thing that I'm reaching for this holiday season, because this is the type of festive red that I always gravitate towards and I definitely think this formula will hold up throughout holiday parties. Honestly, I'm not really surprised at how much I love this lip, but at the same time I kind of am. Make sense? The Charlotte Tilbury Hollywood Lips Matte Liquid Lipsticks* come in 10 shades and are on sale now at on the Charlotte Tilbury website and will be available in Canada at Holt Renfrew and online at Beautylish on August 22. Though I can't speak to the other shade, I would give a huge stamp of approval to Screen Siren and recommend it if you like a classic red lip.